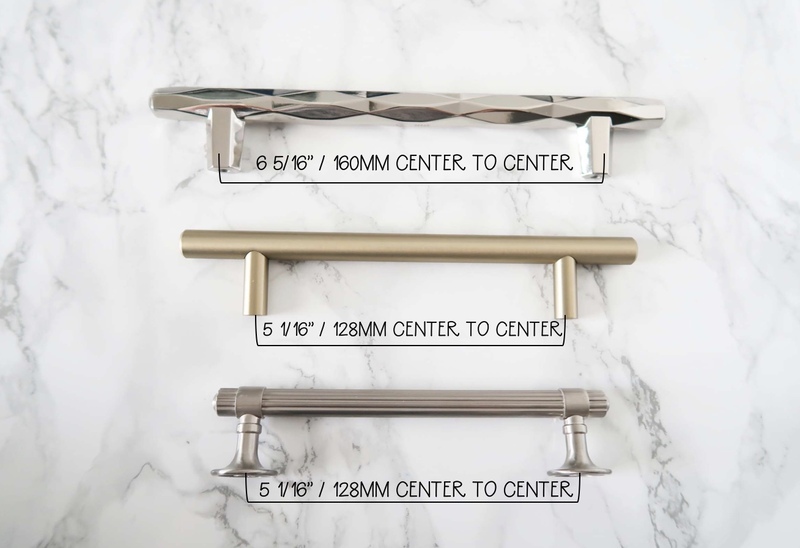 Are you looking at updating your kitchen or bathroom knobs or handles? 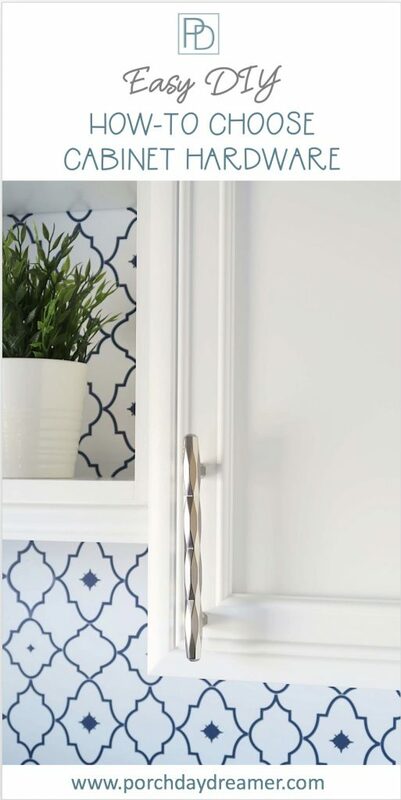 Replacing or adding cabinet hardware is an easy and affordable DIY project! 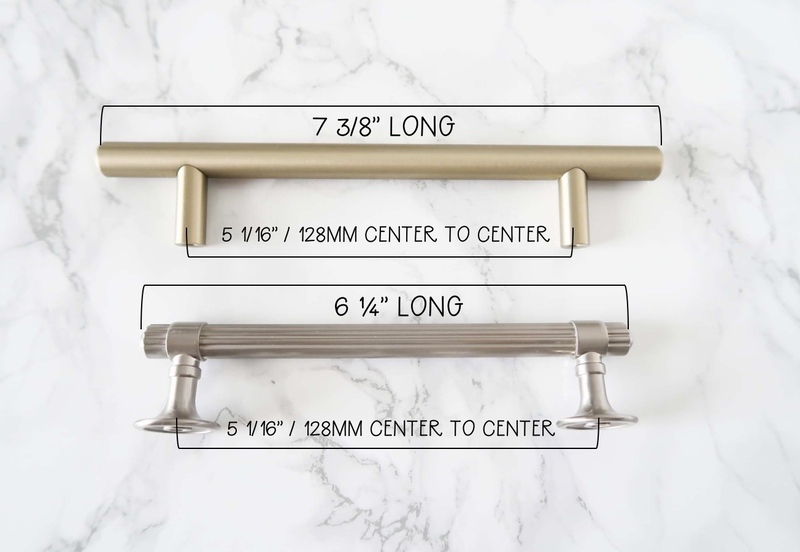 Baffled by how to choose, layout, or measure for cabinet hardware? After working for one of the number one brands in hardware, Amerock, I’m a little bit of an expert on this subject. Seriously, I am a super fan of cabinet hardware! I’ve personally updated ALL of the hardware in my home and luckily have lots of pictures to share with you. Some of them from a professional photo shoot while working at Amerock. Installation was EASY and I’ll detail that below, after we cover the basics of cabinet hardware selection first. Look around the room and notice any other metallic finishes you have in your home decor. Things like faucets, lighting fixtures, picture frames, and metal furniture frames, Do you see mainly gold, silver, bronze or black? Do you want to complement or match the existing metallic finishes? It is OK to mix metals, but most people feel comfortable with matching. Is important to have a warm or cool color cast to the hardware. Warm = golds and bronze finishes. Cool = silver and black finishes. My bathroom has a chrome faucet, bronze drapery rods, satin nickel lighting, and gold hardware. It all works in harmony! Do You Want Knobs, Pulls, or Both? Do you have cabinet hardware installed? If so, is it all knobs or pulls? All knobs, then you can add pulls and even cup pulls. All pulls, the holes are drilled so you have to replace them with the same size. If you have no hardware, you have a blank canvas! Think outside of the box. In my son’s bathroom, I mixed products from two collections for a completely unique look that I can call my own! Next, you need to know the width of your drawers and height of your cabinet doors in order to determine the total length of pull to choose. Proportion becomes very important. 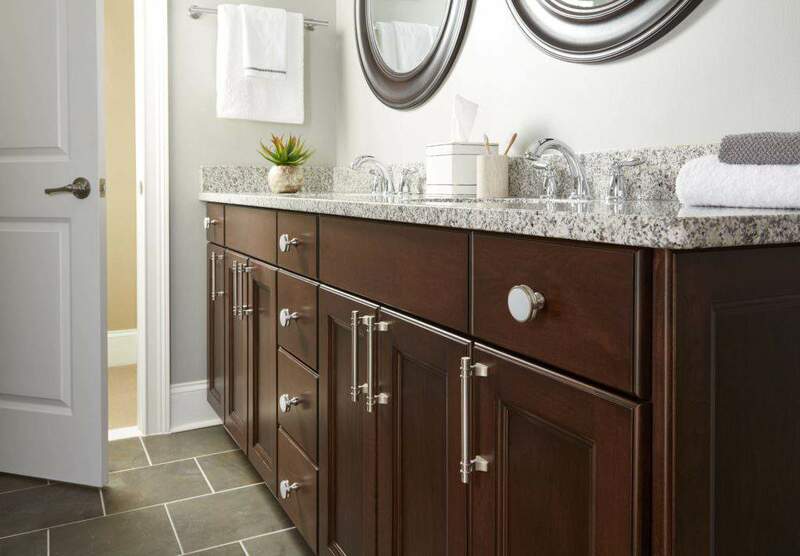 Cabinet Doors: pull length should be NO MORE than 1/3 the total of the door height. 36 inch cabinet door should have pulls 12 inches or shorter. 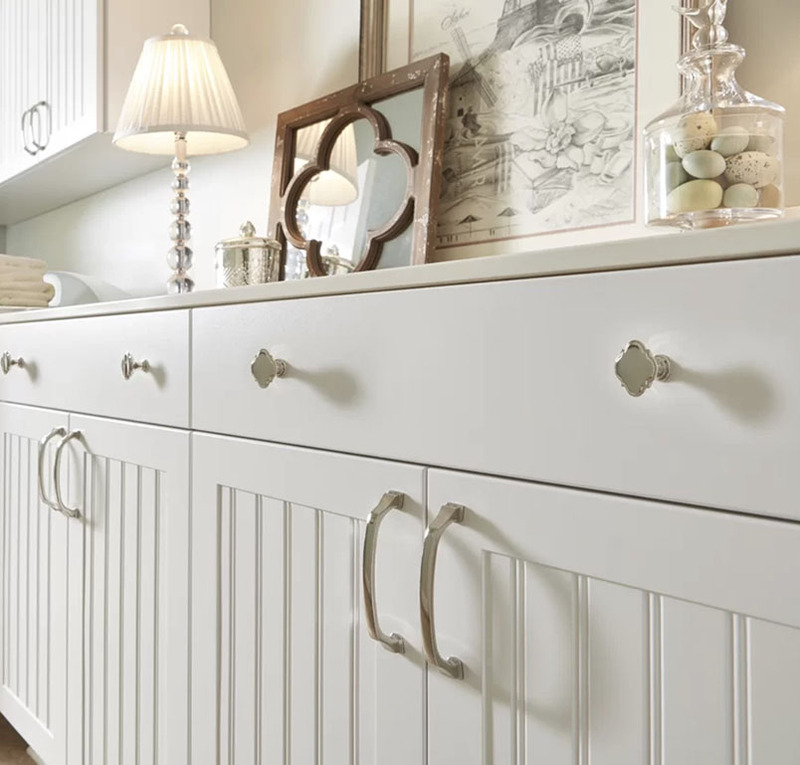 Cabinet Drawers: pull length should be no more than 1/2 of the total drawer width. 18 inch drawer choose pulls 6 inches or shorter. WANT MORE DETAILS AROUND CABINET PULLS: New post with specific lengths by cabinet drawer and door sizes. Most of the time we have hardware already attached to our cabinets and are just updating them. But if you are building a new home, then you are starting from scratch! Installing all knobs feels safe and I originally went this route and have now changed everything! 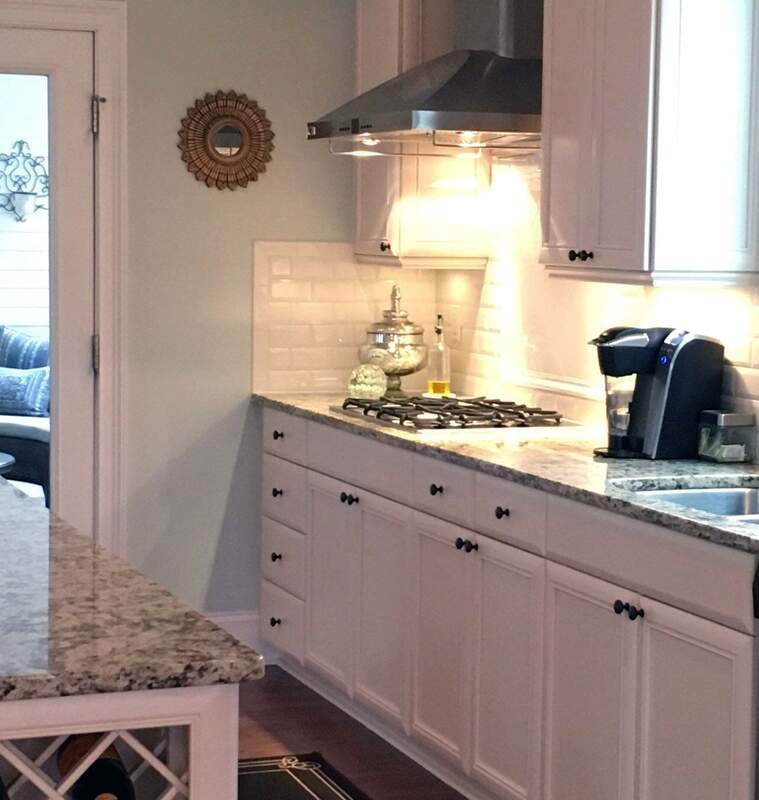 It is safe and easy, but it doesn’t add much visual interest to the cabinets. Mixing up different geometries is much more interesting! For my kitchen cabinet hardware, I’ve mixed different length pulls, with oversized knobs and cup pulls. If you have all knobs, think about replacing some of them with pulls and cup pulls. If you have a blank canvas, then mix up various hardware. This is what my kitchen looked like with all knobs. Very different right? You will notice that a lot of the pictures Amerock features with the products are in my home! It was a fun being able to see the hardware I personally installed shot professionally! Pulls are special and measurements provided by manufacturers are CTC or Center to Center. What does that mean? It is the distance between holes and usually it is in millimeters. It’s a little confusing when you are shopping because most manufacturers show the center to center hole measurement and NOT the total length. Center to Center– the distance from the CENTER of one screw hole to the CENTER of the other screw hole. This is the standard industry measurement for sizing cabinet handles. Here is an example to show you how two pulls can be the same CTC measurement but vary greatly in length. Always think about BOTH measurements and notice if the knob or pull has feet. Feet are nice to cover over pre-drilled holes. MAKE SURE that you take into consideration not only the measurement between holes, but the overall VISUAL length of the pull. If you are working with holes that have already been drilled, you need to make sure the total length of the pull doesn’t end up past the top of the cabinet drawer. Now that you are fully educated on choosing the right sizes for your cabinets, it is time to start thinking about installation. Luckily for you, I’ve installed a TON of hardware and even made two videos showing you exactly how to install cabinet hardware. I’ve compiled some knobs in a variety of finishes to get you started and inspired 🙂 Most knobs will have a coordinating pull and if not, you can always find a matching simple bar pull. Or do like I did and mix collections, but always do that within collections from the same manufacturer so the finishes match. I can vouch for Amerock that this is possible! Gold Tone 1. | 2. | 3. | 4. | 5. | 6. Silver Tone 7. | 8. | 9. | 10. | 11. | 12. Bronze Tone 13. | 14. | 15. | 16. | 17. | 18. Now you are all set! Have fun and enjoy the affordable change that cabinet hardware delivers. 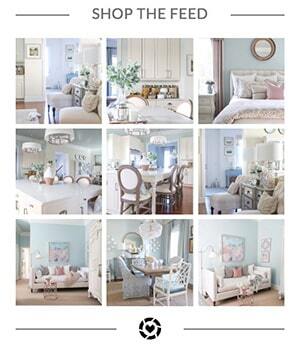 Do you like this guide or maybe are thinking about updating your paint colors too? 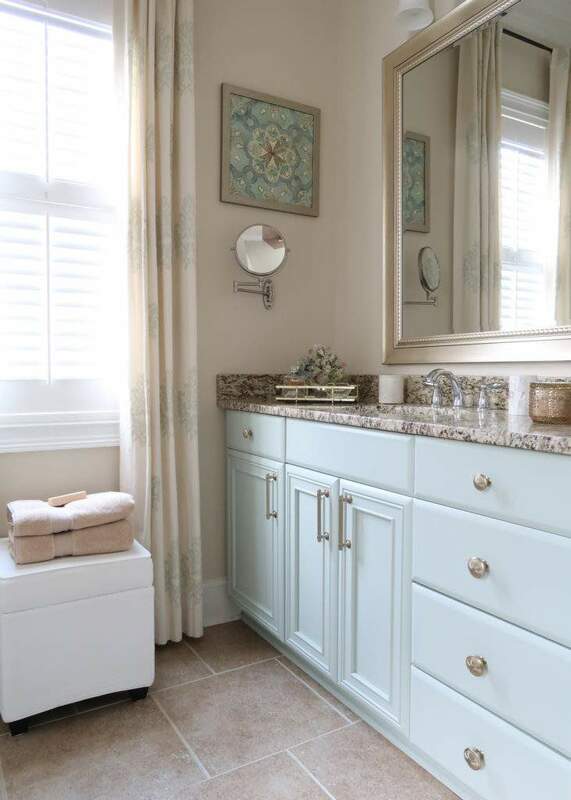 CLICK HERE for how to choose paint colors. 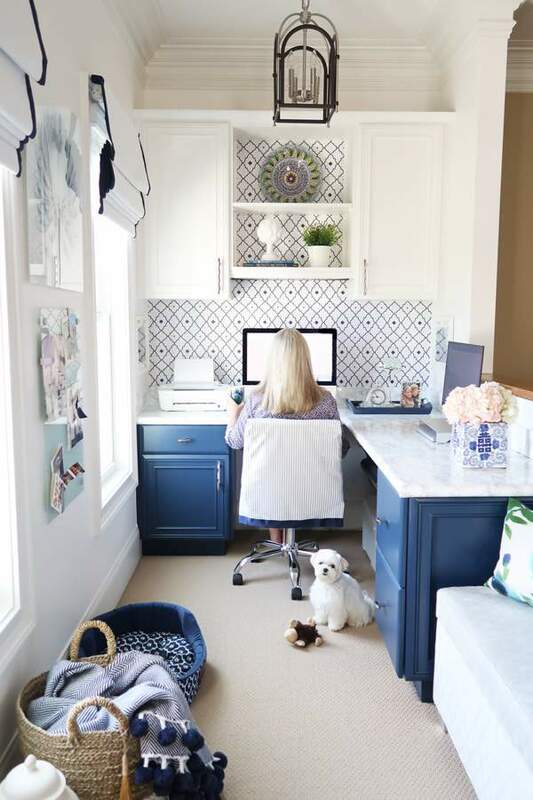 Maybe you want to paint your cabinets like I did in several of my rooms? CLICK HERE for a full cabinet painting tutorial. I like that you mention adding visual interest to cabinets by mixing up geometry, such as using different length pulls and knobs. When choosing, it could help to check a local hardware store to see what they have to offer. It might also help to consider what aspects you want to stay the same, such as having them all silver metal or dark wood, so that they still work together to create a beautiful overall design. Hi, Tracey! Just was introduced to you via Stacey at Poofing Pillows. I was looking for your subscribe button, and just now saw it come up in a pop-up. 🙂 Glad to have found it! 😉 I’m a single mom, as well, but now an empty nester. 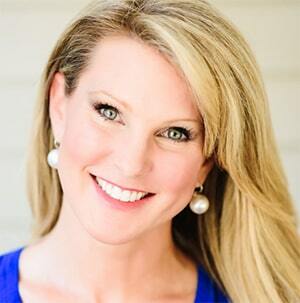 Looking forward to getting to know you and your blog! Julie, welcome! So glad you saw my pop-up and decided to sign up for my weekly email. Single mom and empty nester too huh? I drop my son at school this weekend, but it is year 2 for us. I’m hoping I don’t cry for the first hour of the drive home like I did last year!